Batty® brings the elements of an ancient classic, The Tower of Hanoi, into the 21st century. However, the Tower of Hanoi’s formula is visible to the player via the disk set-up; Batty® heightens the challenge by randomizing the cards and burying the formula. The varying degrees of difficulty vary from second grade to a statistics professor. Scroll to the bottom of the page to watch Richard Turner demonstrate in the video below. The range of complexity varies with each shuffle. A level 5 can be resolved between 20 to 31 moves to solve a level 11 will take anywhere from 1023 TO 2047 moves and that’s if you don’t make a wrong move. However, unlike some solitary games, no matter how off the track things get Batty can always be resolved. Made by the U.S. 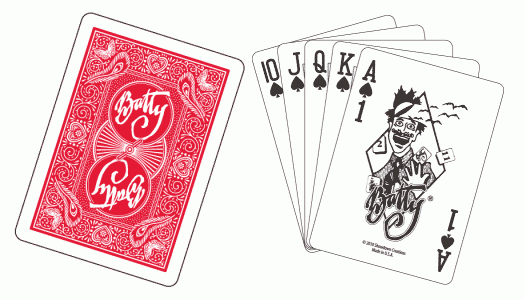 Playing Card Co., this Traditionally Cut deck has the classic looking Bicycle Mandolin back. The faces, pips, and numbers are drawn by a Disney artist and illustrate things that drive us all Batty! If insanity occurs, Batty can double as a standard pack of 52 playing cards. Batty can be played solitaire or challenge your sanity against a group. To purchase Batty, visit our Shop. Answer: Here is a brief description of the basic play with examples. To learn the game, start at the lowest level “3.” Remove any 1, 2, and 3 cards and set all other cards aside. (Again, suits don’t matter). Place the highest card (in this case the 3) face down on pad C.
Mix the remaining 2 cards and place them face down on the high card (which in this case is the 3) on pad C.
Rule 1. A player can only move one card at a time and cannot slide a card out from under another card. Rule 2. A player cannot place a high card on a lower card, but any low card can be placed on any high card. We flip over the last card, and it’s the “3,” which is higher than all the cards (the “1” and the “2”) and can not be moved because we can not place a higher value card on a lower value card. However, we can move a lower card onto a higher card. Level “3” is complete. Add the “4” and move to the next level! There are three ways to play Batty. One is the long game as described above. Three is a group game. (1) No, you cannot place a higher card on a lower card. (2) Yes, you can place any lower card on any higher card. (3) That’s correct; the suits do not matter. (5) No, you cannot slide a card out from under another card. You must move the top card first. (6) Yes, no matter how badly things seem to be screwed up, unlike some games of “Solitaire,” Batty can ALWAYS be solved. (7) Yes, every time you add one card, the number of moves to solve Batty doubles. (8) Yes, Batty can be played as a group. (9) That’s right; when you play as a group the suits don’t matter. (10) Yes, there are enough cards to accommodate four players, and yes, you can mix two Batty games together to accommodate more players. (11) Yes, the level “11” has a minimum of 1,023 moves and, given the worse case shuffle, it could take up to 2,047 moves to unscramble—and that’s if you make no mistakes. One unnoticed mistake (when playing the higher levels) can take dozens or even hundreds of moves to correct. And remember Batty can ALWAYS be solved.